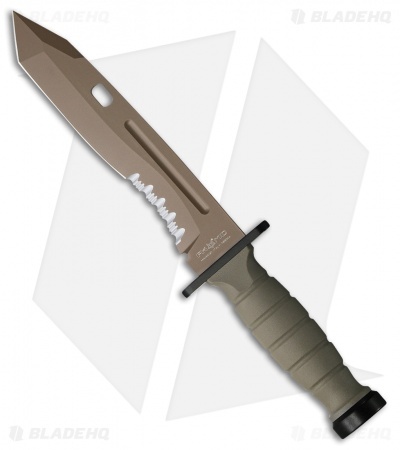 Aggressive and durable, menacing and confident, the Fox Oplita Combat knife can do anything in the field. The substantial 7.25" blade begins with an extremely tough tanto point, excellent for thrusting or piercing, continuing to a flat non-serrated portion capable of slicing or chopping, then transitioning to a partially serrated edge for more powerful cuts or sawing. The non-reflective coyote tan finish not only assist concealing any blade flash but also protects the steel from corrosion build up in harsh environments. The Coyote tan Kraton handle is comfortable and secure in hand, filling the palm while not creating hot spots. 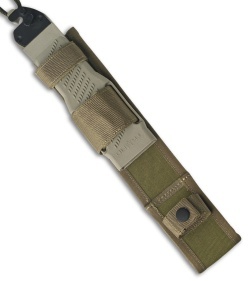 Included is a coyote brown nylon reinforced fiberglass belt sheath that features integrated wire cutting plate and sharpening stone.